The most common cultivars of Swiss mountain pine (or mugo pine) are dense and bushy shrubs, usually broad spreading or rounded. 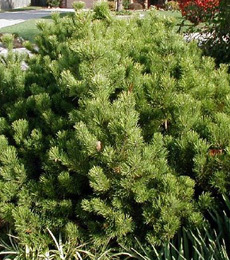 Shrubby cultivars of Mugo pine are normally used in foundation plantings, shrub borders and in groups as specimen shrubs. This is an outstanding maintenance free little shrub with very dense foliage and a fine to medium texture that works well in most landscape settings.